Finally! 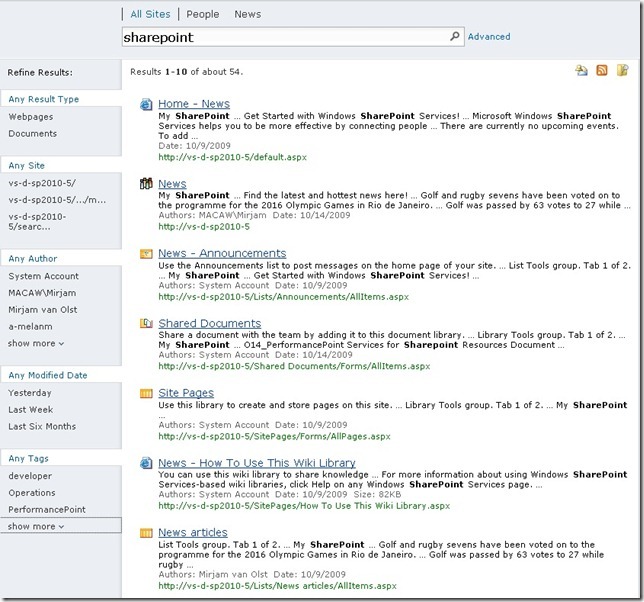 We are allowed to talk about all the cool new stuff that SharePoint 2010 will bring us! 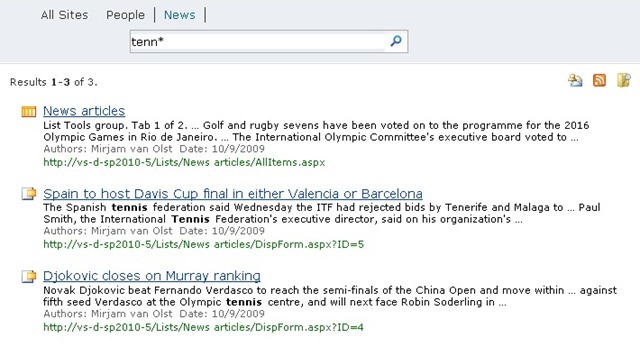 The first thing I would like to do is show some of the new features in SharePoint Search 2010. 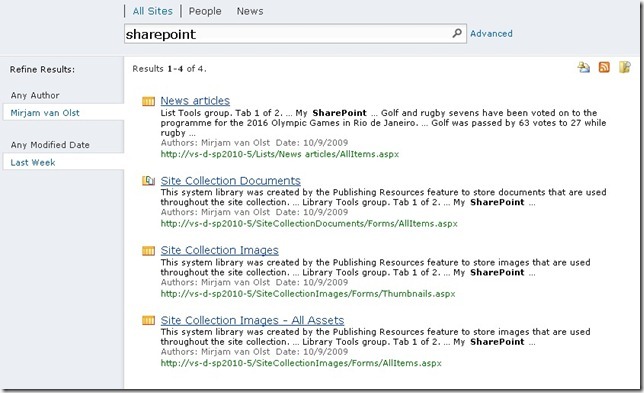 Reason for this is that there are a couple of very cool new features that customers have been asking for since SharePoint 2003. Up until now we have used third party products, CodePlex solutions or our own solutions to close some of the gaps, and for others we have simple told customers that it wouldn’t be wise to try and implement the functionality in SharePoint. 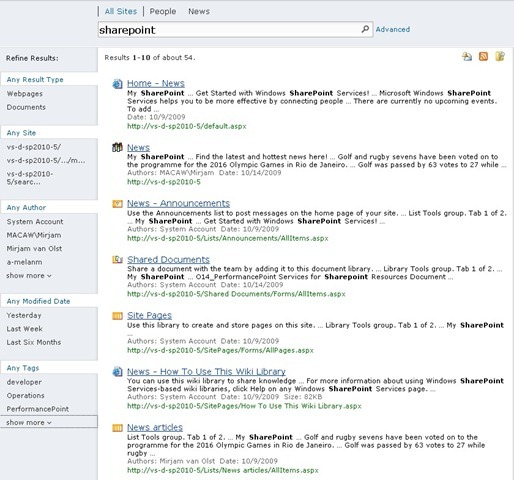 Overall you can say that searching your intranet will be more like searching the Internet, so people should be familiar with most of the new concepts and features. For this blog post I created a list of 5 news items. Three of them have to do with the Olympics, the two others are about tennis. I created a custom scope called News that only shows results from this list of 5 news items to keep the results nice and clean. 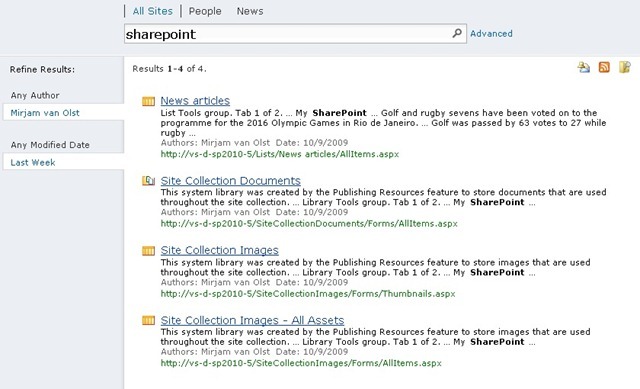 The first one of the new features is the ability to use query syntax while searching your SharePoint environment. This means you can use AND, NOT and OR in your search queries. Be mindful though that you need to use capitals, otherwise they will considered additional search words. 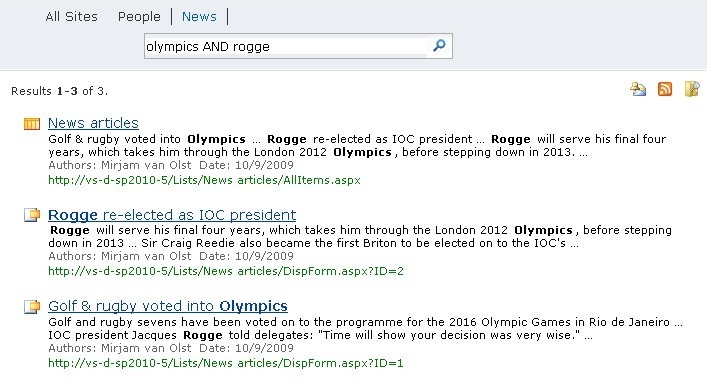 You can for instance search for “olympics AND rogge”, of for “olympics NOT rogge”. The screen prints below show the results of these queries. The second new and often requested feature is wildcard search. 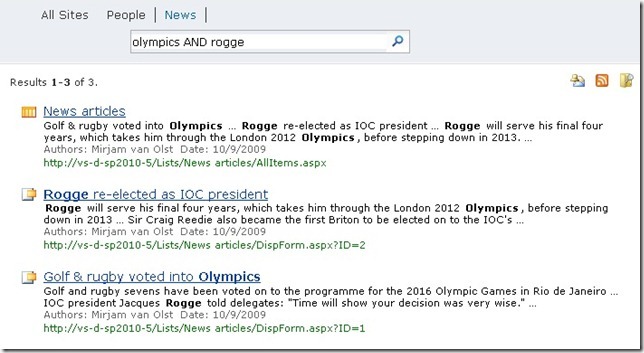 Search queries can now match a wildcard at the end of a text string. You can for instance search for “tenn*” and get results that have the word “tennis” in them. Searching for “tenn” will get you nothing. Wildcards only work at the end of a search string, a wildcard at the beginning of a string will not be recognized, so searching for “*nnis” won’t get you any results. 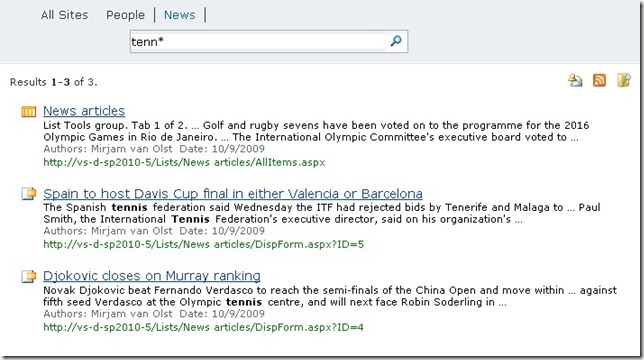 Faceted search is another new feature in SharePoint Search 2010. When a search query returns a lot of results the faceted search functionality displays a refinement panel on the left side of the screen. In the panel you can refine the results based on criteria like Result type, SIte, Author, Modified Date and Tags. What refinement possibilities are shown depends on the result set. Administrators can also configure other the categories that are used in the refinement panel based on managed properties and enterprise content management taxonomy nodes.